Time for our tin foil hats again!!! I had similar thoughts, and looked for any Google connection. I think the switch to Google data operations was a good move, but was uneasy about being too cozy with Google. No one knows the details but I know that won't stop people from posting. My thoughts are to be thankful that O’Neill navigated Evernote to financial and operational stability. He bought us a few more years in the inevitable (?) decline and fall of this product/service. I read Ian's introductory blog this morning. He said he wanted to hear from customers. I couldn't find an easy way to pass along my feedback. Ian, I hope you'll read this. As I think about the apps that make the use of a computer worthwhile, there are just a few: a web browser, Microsoft Office, an email client, photo editing software, an autocorrect utility, a screen grab utility – and Evernote. Rumors of Evernote's demise greatly concerned me. I am hooked on using Evernote as sort of a Swiss Army knife to use to write down my thoughts, keep notes on various things, capture snippets of information, etc. I use the Web Clipper all the time. It is very handy to capture a note on one device and look it up on another device. It's been hugely important to be able to load Evernote on a new computer and have almost 10 years of notes, thoughts, and information magically appear on it. But I've had my share of frustrations too. Only recently the dictionary function on Windows seemed to get fixed. Really? The UI is all over the place. Honestly, I never seem to remember how to use the iOS apps, both of which are oddly different. Touch on my Dell laptop didn't work because Evernote stopped supporting touch (maybe you do now; I don't have a touchscreen laptop now). I have lived through the Evernote Moleskine days and all of that distraction. In 10 years I've never really felt like Evernote truly knew what its center of gravity was. I hope that will change. Make Evernote nice to look at and easier to use: It's been a while, but I recall that the Mac UI was really nice. The Windows UI is utilitarian. Hire some designers and UI experts and spruce it up. Create some consistency between the iPhone and iPad apps and allow users like me to easily move between them. But don't dumb Evernote down: If I want a dumb note app, I can use Google Keep. OneNote used to be overly complicated and now they have made it overly dumb. Easy to use should mean easy to use, not dumbed-down to the lowest common denominator. You probably should support Markdown: It's not my cup of tea, but why not offer it to customers who love it? I think there are a lot of folks out there would would prefer to write notes in Markdown. This is my cup of tea: I would like the choice of a more sophisticated editor. I don't want a Word clone, but some more formatting tools would be nice. One thing I would love is the ability to set my own paragraph spacing. I would love to have Styles. A table function that really works would be nice. How about offering three editor UIs: Document creation, standard (i.e., the one that is used today), and Markdown. Leverage your cloud: I've always wondered why Evernote didn't go in the direction of Dropbox, Google Drive, and OneDrive. Evernote was the "100 year company" – I would have trusted my photos (30,000 of them) to Evernote. Now I pay Microsoft. That might be too far from your center of gravity but it makes more sense to me than Moleskines. Fire your brand consultants: Recently I read Chris O'Neill's blog article titled "CEO Notebook: Say Hello to a Refreshed Evernote". It read like a long-form Dilbert comic. "Engage with what matters!" "Extend impact!" "Explore What's Possible!" Evernote is a software product. It does stuff. It will not solve world hunger or achieve peace in the Middle East. For my photo editing I recently switched from Adobe Lightroom to Capture One because its features are better. I use Snagit instead of free screen grab utilities because its features are better. I could go through the list of the software I've selected and I suspect in every case I make a choice because of a combination of features, ease of use, visual attractiveness, and price. Microsoft office is the only thing I use because my company requires it. Stick to making the product better. Fire your brand consultants and hire some UI experts. Software quality has to be rock solid: The dictionary thing really got to me. How could a company in business as long as Evernote have such a flaky dictionary? There are other software issues I've encountered over the years. This is table stakes. In conclusion: Please don't let Evernote die. It is a pioneering product that is still very relevant. It has competitors but I think Evernote is still the best. You need to keep it there. You need to keep a clear eye on what you do well and avoid things that are peripheral. I think Adobe's strategy is a good one to watch. They are creating a cloud-centric model with a solid focus on the workflow of creative people and leveraging the power of tablets. Although I personally prefer a competing product, I think from a strategy point of view they are making some excellent moves. What Microsoft is to office apps, Adobe will be to creative apps. Maybe Evernote won't ever be a Microsoft or Adobe, but I think you should aspire to being identified as the King of the Hill in a core area of application usage. Yes, indeed! Markdown support would be fabulous. I couldn't find an easy way to pass along my feedback. This is not the place to post feedback and feature requests. Use the Feedback and Feature Requests forums. Also, separate posts for each request works better. Get involved with your users and let us hear your voice (personally)! ?? Perhaps 3rd time's a charm. Competition; Every n'th post praises alternative products; usually focussed on editing. Money; My impression is the funds are not available for extensive development, let alone keeping up with OS changes. Competition; Every n'th post praises alternative products. Oh, pshaw. We all know that the Feature Requests forum has been utterly ignored in the past (night mode being the most egregious case-in-point). The new CEO asked for our feedback but gave us no way to send it directly to him, as Emmgee pointed out -- but if there's ONE thread that he's likely to read on this entire forum, it's the one ostensibly about him. @emmgee I just wanted to let you know that I passed on your insightful post directly to Ian, and can verify that he personally read the complete post. If he wasn't super busy right now trying to come up-to-speed and meet with everybody, I think he'd like to personally respond to everybody on the forum and engage in a conversation. He may still if he finds some free time soon. But, I encourage everybody on here to continue to engage in these conversations. We might not always be able to respond, but we're listening. If I may, I would like to offer a few suggestions. In my humble opinion, Evernote should focus on encouraging its users to use links rather than tags or notebooks. As it currently stands, Evernote presents itself as an unfinished tool, and every user invents his/her own way to use it (some much better than others). As a result, many users often misunderstand Evernote, never discover it's underlying strengths, are overwhelmed by its complexity, and I suspect often end up abandoning Evernote for other alternatives. I realize that Evernote was developed with the strength of 'Search' as its primary method for finding notes. This may work well for the engineers who created Evernote (and for users with engineering mindsets who like standardized naming conventions and complex search syntax), but for many of us, the process of having to search for notes is a major limitation. Tags seem to solve this problem, but end up being a nightmare to organize and maintain in Evernote (particularly if you're lured into the seemingly logical approach of nested tags). The Bear App (a new competitor) has solved these problems - but their implementation of tags is still cumbersome when compared to links. Links are much more intuitive to create than tags, and links are also easier to navigate (when finding your way back to a note). Tags in Evernote iOS also suffer from the limitation that they lose their desktop nested structure and thus require searching - which means you have to remember the names of all your tags -- we're back to the necessity of naming conventions and search syntax. If you work on a desktop all day, then you're unlikely to care about this problem (hello engineers). Bear solves the iOS tag problem by presenting a nested tag structure along a left-hand column that is identical in desktop and iOS. But, as mentioned, tagged-based organization is less intuitive than links. And Evernote crushes Bear with the quality of its tools -- the best of which include outstanding web clipping capability (much better than Bear), PDF management that includes the ability to sync PDF highlights and PDF notes (a major limitation in Bear), and the ability to resize images (also not available in Bear). The Notebook interface is the same in Evernote and iOS -- but Notebooks have the distinct disadvantage of not allowing one note to be in two or more places at the same time. For example, a clipped web article (note) on the health benefits of dark chocolate that includes a brownie recipe can't be simultaneously stored under Health and under Recipes, nor can it be simultaneously attached to a shopping list, nor entered as a todo item to bake this weekend. Linked notes solve all these problems: Links work the same way in Desktop and iOS. Links function as well as tags in allowing one note to be attached to multiple headings, notes, and projects. Links don't require time-consuming Evernote 'tag maintenance'. Links are intuitive and familiar. And most important, links don't require searching. Evernote needs to be simplified if it is to be adopted by a larger audience. Shift away from search as the primary method to find notes (it will still exist for engineers). Deprecate tags. Build a tool to allow tag-users to attach their unique tag names to the end existing note titles - so they can continue to use search and thus be 'grandfathered in'. All true power users/engineers on the Forum (who love naming conventions and search) recommend the approach of using unique note-title naming schemes and avoiding the use of tags for primary organization. Most importantly, build better and more intuitive link creation tools. Then promote and advertise Evernote's primary (new) feature: That it is highly intuitive and works the same way everywhere (via links) -- and that navigation of your notes is as easy as using the internet. Finally, simply links. At present, there are two types of links (Note Links and Classic Note Links) that work in three different ways: There are links between notes, links to the web browser version of Evernote, and links to third-party programs (such as ToDo apps). Have Evernote engineers create some sort of AI so Evernote knows which type of link to create or implement under different contexts. Congratulations again on your new position. Speaking for all devoted Evernote users, we sincerely wish you success. This is off-topic, but I'd like to hear more about using links instead of tags. As an example, I have 50+ notes connected to 2018 taxes; receipts and such. How would this be done using links? >>B﻿uild﻿ a tool to allow tag-users to attach their unique tag n﻿ames to the end existing n﻿o﻿te titles - so they can continue to use search and thus be 'grandfathered in'. I use scripting on my Mac to append the metadata to the note contents. btw Links sort of lock you into Evernote. There are a LOT of users out there using tags quite intensively - and some of their histories probably go back 10 years. I'd think they (and I) would be mortally upset if tagging got deprecated. I use titles as my principle indexing tool, supported by searches to link multiple notes together. Where necessary I can generate a ToC from a search, and merge, edit or tag notes to link them more strongly if necessary. I don't especially 'like' tags as they current are: it's too easy to tag topics with different words for the same thing - "banks bankers banking" and throw in more confusion with mistypes - "bonkers". Much better if there were more and better management tools for tags (and links!). I don't especially 'like' tags as they current are: it's too easy to tag topics with different words for the same thing - "banks bankers banking" and throw in more confusion with mistypes - "bonkers". Much better if there were more and better management tools for tags (and links!). It seems to me the Tag feature is the tool for avoiding different words for the same thing. I start typing "bank" and a filtered list is presented to select from. I use the same tag list for my in-contents tag/keywords. I clip, therefore I tag (badly) ? To answer your specific question, once you find all notes that contain both of your tags, tag:Taxes and tag:2018, then select all of those notes and create a Table of Contents note. Name that note, "2018 Tax Deductions" or whatever makes sense to you. Then right click on that TOC note and select "Copy Note Link". Paste that link into your Taxes Notes under a heading that makes sense. Then erase those tags (once all your notes containing one or both of those tags are in linked to parent notes) ? Seriously! What's the point? Links don't break unless you move a note to the trash. Harder to accidentally do than mistakenly erasing a tag - and potentially losing a giant collection of notes. The next time you create a new note, don't add a tag. Instead, immediately link it to a parent note. Use two Notebooks: Inbox (which contains unlinked notes) and Archive (which contains linked notes). Keep it simple. The goal is to create readable notes that comprehensively cover one topic, and not to create some kind of complex directory in Evernote that you constantly have to search. another evernote enthusiast with a strong opinion here. to me evernote is 1st and foremost a personal database with huge flexibility to build my digital processes on top of it (in my case literally all of them). having notebooks and tags gives a tremendous degree on flexibility on how to structure and view my data. and this is why I love and need it. another amazing strength of evernote is the multitude of ways I can feed data into it. I use web clipper as a "read it later" process in evernote, anything I scan goes straight into my evernote setup, any idea on the road or task in a meeting goes straight into my GTD implementation on top of evernote in my mobile app, etc, etc. where evernote has been falling behind is giving that same flexibility in data representation. we do not have kanban boards (trello only exists due to evernotes weakness in this area from my perspective), we do not have graphical representation allowing us to take a fresh look at our data sets to gain new insights (hello bubble browser, hello droptask), we do not even have spaces for premium customers (yet?). there might be good business reasons for focusing on business customers and I do not have the user nor revenue data, so I am sure you will know what to do business wise, but in my experience there is much more spill over from premium users importing evernote into their business lives than the other way round. enthusiastic individual users make new business customers. and then there is stability and performance. I do not need to re-state the obvious, just get somebody to summarize the feedback on the forums here as well as on the support side. there is substantial room for improvement. also watch out for notion as these guys have (imho) understood the personal database and data representation opportunity evernote has left for them. this whole personal database/productivity space is evernote's to lose. it's just up to you and your new team now. release spaces to the entire base immediately. acquire one of these smallish data representation companies and integrate it into evernote fast. I'm thinking the sequence in the Table of Contents note will be random; or a single sequence if I take the time to insert entries in order. If I need a Table of Contents, I can create it when required. No, I will not delete my tags. The point is, tags provide a dynamic method of generating a note list. Focus on making Evernote truly great at its primary purpose of being the world's greatest Personal Information Manager (PIM). Focus on making Evernote truly profitable. Don't be lured by the false promise of having 250M+ Users who pay nothing. When you have #1 well in hand, then focus on making it great for small businesses. I look forward to hearing from you soon as to how you are going to turn-around Evernote. Now, about Tags . . . Tags seem to solve this problem, but end up being a nightmare to organize and maintain in Evernote (particularly if you're lured into the seemingly logical approach of nested tags). You make an assertion without offering any examples or proof. As user who uses tags as the primary means of organizing and finding Notes, I totally disagree that Tags are a "nightmare". They work quite well for me. Perhaps the issue is in your organization of Tags. Tags in Evernote iOS also suffer from the limitation that they lose their desktop nested structure and thus require searching - which means you have to remember the names of all your tags -- we're back to the necessity of naming conventions and search syntax. This I totally agree with. All devices should support the same Tag structure, meaning that iOS devices should also support Tag hierarchy. Also, when typing "tag:" in the Search box (on all devices), Evernote should provide a auto-complete popup that searches/finds the tag as you type -- just like the Tag Filter works on EN Mac. All of this would help both the experienced "engineer" types, as well as newer users easily and quickly find and assign Tags, avoiding any duplicates of similar keywords. I strongly oppose this. It would destroy my entire organization of Notes. No one is forced to use Tags. So if you prefer some other means of organizing your Notes, you are free to do so without impinging on other users. Click on "Create Table of Contents Note"
Give the new TOC note a name that makes sense to you, e.g., "2018 Tax Deductions"
Right click on the new TOC note and select "Copy Note Link"
If you want to see a beautiful implementation of tags, try Bear. Its use of tags is a little piece of genius. Then you'll see why going back and forth from your Notes to Tags to constantly organize your tags in nests in Evernote is a nightmare. Strong word, I admit. But it is no fun trying to find and maintain your notes with tags and search in Evernote. It makes it hard for me to think clearly. I'm sure it works better for you. But after giving this much thought (and rebuilding my Evernote collection of approximately 10,000 notes three times: First with tags, then folders + tags, and then links only ... plus switching to Bear and then back to Evernote), I've found that links are the best because links force you to write better notes - as our English teachers taught us, "writing is thinking". Notes with links are in large part more clear because you can have one note per topic - you should certainly strive for this. With all the relevant links built in. Bear can use links too, but Evernote has much better ancillary tools, including web clipping and PDF management. Ultimately, you want to use Evernote as a Note Taking System to help you think better, and not as a computer directory. You already have a hard drive for that, and it has the potential for incremental backup, mass storage of files, etc. And there are plenty of programs which allow you to add tags and metadata to the files in your computer directory. Ultimately, you want to use Evernote as a Note Taking System to help you think better, and not as a computer directory. If that is your purpose, that's fine. But, IMO, it is not the best tool for that. Some would argue that mind-mapping, diagramming, and outline tools are better for that. I use Evernote to quickly capture thoughts and ideas, and some follow-up actions. But when I comes time to use that info, I generally use another tool. I like the conversation, and I can't disagree with you. I too use Evernote as a PIM, but I prefer to also use it as a jack of all trades, to organize my thoughts, and plan my projects, trips, etc. 90+% of my content is generated outside of Evernote. My background is an office, using Word/Excel. I'm comforable using external dedicated editors. Of course you can offer your opinion, but this is a very strange stance to take. Tags, notebooks and links serve entirely different purposes. A wise Evernote user knows how to use them as appropriate. Using links exclusively would be a very poor way to operate for many people; they just do not do what tags or notebooks do, thus robbing an Evernote user of powerful categorization and organizational functionality. As it currently stands, Evernote presents itself as an unfinished tool, and every user invents his/her own way to use it (some much better than others).﻿ As a result, many users often misunderstand Evernote, never discover it's underlying strengths, are overwhelmed by its complexity, and I suspect often end up abandoning Evernote for other alternatives. Sure, Evernote could be better, but having different options is a strength, not a weakness. Each of the aforementioned bits of functionality are useful, and they gain even more utility when used together. The curious thing is that you do web search using literal text (and there's a more complex way of searching available beyond what most people use); you don't find things on the web just using links. Remember Yahoo? They tried that; that approach lost, convincingly. Text search in Evernote doesn't work the same way as it does in Google, but it does work. Beyond that, tags allow a user to categorize (read "describe") notes in ways that are meaningful to them. I use them in ways that mirror what we learn early on to do with language, as nouns and adjectives. I don't find them difficult to organize or maintain because I don't spend much organizing tags; I'd much rather use tags to organize my data. Again, links do not do what tags do. Using tags as a vocabulary to describe your notes is no less intuitive (whatever that means) than links; we learn to use language to describe our world very early on in our lives; what is the parallel for links? Side note: for those people who do use tags to form hierarchies meaningful for their purposes; it's indeed a drawback that the hierarchies are not exposed on some devices. That's a flaw in tag implementation, not a flaw in the utility of tags. The Notebook interface is the same in Evernote and iOS -- but Notebooks have the distinct disadvantage of not allowing one note to be in two or more places at the same time.﻿ For example, a clipped web article (note) on the health benefits of dark chocolate that includes a brownie recipe can't be simultaneously stored under Health and under Recipes, nor can it be simultaneously attached to a shopping list, nor entered as a todo item to bake this weekend.
. I use notebooks sparingly, but in Evernote, they have at least one important usage: you can share individual notes, or individual notebooks. I share several notebooks between my two accounts, and I use notebooks to do it; this generally works well for me. Sorry, but this is misguided. Linked notes do not do this in a way that's convenient for many users, because many Evernote users are comfortable with search. Links are nowhere present in search. Linked structures do not scale well in general: using links to organize a large and varied set of notes will force you into trawling down through a trail of linked notes. Even Wikis, which use links a lot, support search, because it's faster and more convenient for many use cases. And please stop using "intuitive" to describe links. They are not intuitive; they are learned functionality, as is a lot of computer functionality. Most humans learn to use language earlier than we learn the concept of linking. This. Will. Never. Happen. The upshot of your suggestion here deprecates use of tags exactly how? If they are available in search and behave as they did before, why would any software company go through the added gyrations to deprecate them and/or change their underlying implementation so that they behave exactly as before? That would be madness. Oh, and by the way, I am a pretty avid tag user, but I choose not use the note title naming schemes that others find useful. Please do not conflate these two usages. I don't want my titles mucked with; tags work fine as they are, thanks very much. Link creation is certainly something that could be improved. And links themselves could be improved: in particular, links that point to specific locations inside a note would be very useful. All of this has been proposed via feature requests before, but nowhere have I seen them be promoted as the one true solution for Evernote. Links are just one of a set of tools that you can use to organize and navigate your notes. A carpenter has a number of tools in their toolbox; you don't build a house using only a hammer. And have you forgotten that "using the internet" often starts with a search, not a link? Me, I used to keep trees of bookmarks, until organizing bookmarks became a chore (because links don't scale well). Now I keep a small collection of frequently used bookmarks, but search generally suffices for the rest. Much faster and more direct then pawing through a tree of bookmarks. Sorry, but your post makes little sense for many current Evernote users. You criticize tags without seeming to understand what they're good for. There is no best single way to organize and navigate your notes. There are approaches and methodologies that work for certain usages; links alone are not sufficient to encompass them all; neither are tags or notebooks. Indeed, a note taking app deserves a quality editor. Users kept begging for improvements and quite a number of users got fed up by the apparent indifference and left. The 220 million plus/minus eager subscribers were doing what? Leading you astrey in believing that they were all happy lovers, eager to part with hard cash? Evernote is so low down in ranking that nobody bothers to report the change in leadership. I don't especially 'like' tags as they current are: it's too easy to tag topics with different words for the same thing - "banks bankers banking"
Generally we're in control of our own tag vocabularies (speaking as a solo user, not as a group participant). Since I don't use tags for navigation, the largest part of any tag maintenance that I do (which is not a lot) is figuring out inadvertent tag synonyms, and paring them down. Occasional rainy-day stuff. An interesting improvement might be the addition of ways to specifying that certain tags are synonymous, so that a search for "tag:banking" would turn up notes tagged with "banks" and "bankers". Not that those words are actually synonymous; they're related for sure, but they don't mean the same thing. And obviously I know that you already know that a search for "tag:bank*" matches all of these. OneNote used to be overly complicated and now they have made it overly dumb. Easy to use should mean easy to use, not dumbed-down to the lowest common denominator. We've had this discussion before; I'll agree a word processing app deservers a quality editor. I am not entirely sure if you'll read this but here goes. First off, congrats on the post. I really do hope that your background will take the company in a new fresh new direction and I really look forward to being part of that. I am not a power user like most of the folks here; in fact this is the third time I've made my switch back to EN and it took me 3 times to finally understand how to use this program effectively. I feel that the reason a lot of people decide to ditch the app is because it doesn't work the way they want it. And to this extent I agree. Most of the new users who install EN expect a place where they can just type notes. Some people (like myself) decide they can use this as an alternative for a word processor. I feel its crucial that you have to address both these groups in the direction you're planning to take. Thanks for your work with Evernote and adding financial and operational stability to the service. I'm a happy Evernote user (Mac and iPad), and don't have any advice/requests other than please keep the Evernote service running. I trust you and the talent at Evernote know what needs to be done. Maybe some focus on existing bugs; the Windows folks seem to be hurting the most. Did you ever consider that your assessment of what users should expect from Evernote's editor left a ripe proportion of users with a feeling of frustration, if not to say profound annoyance? The "Remember Everything" service is no longer unique to Evernote. Search engines made advances by leaps and bounds. Of course, there is always the factor "you get what you pay for". However, 3 years ago there was a substanstial increase in subscription fees. Revamping the site and the logo instead of tackling core functions must have turned scores of premium users right livid. No doubt, Evernote went into a downward spiral and retiring Mr. O'Neill was inevitable. His setting the target at achieving positive cash figures for the financial year was deplorable. Considering staff cuts at all levels it just meant "sorry, cash is so low, we are working with a tight budget, we are not credit-worthy any more. If we cannot consolidate our financial status now, we are either up for sale or gone with the wind". I too share the genuine hope that Ian Small is the right man who can sort out priorities. The policy of leaving customers in the dark failed beyond repair. Personally I feel If Evernote cannot consolidate MacOS and WinOS versions pretty darn quick it will be mission failed. - and that navigation of your notes is as easy as using the internet﻿. If linking is the ultimate solution, then why does Google still exist ? My assessment of the Evernote editor is accurate. I am an experienced computer professional. I know the limitations of the editor and the enml/html base format. If Evernote's editor is working for you, you"re welcome to use it; I need more extensive features. Personally, I avoid using tools that give me frustration and annoyance. There are plenty of editors to chose from. A note can contain files of any format. Right, it's a free editor that comes with the service. Then again, I'm using Apple Pages/Numbers; free editors that come with the hardware. I totally have to disagree. Tags are the 'heart' of my organization system, anything messed up there, and the whole structure comes crashing down. Infact, i prefer 'tags' a gazillion times to inbuilt-search. Yes, I use 'Note Links', 'Notebook-Stack' organization too, its a marriage of all tools that Evernote provides, including pin-ups ( Reminder Feature). One can't live without the other, although if i had to pick ( which i wouldnt want), first it would be 'tags'. But then, to each- person, his own. The beauty of Evernote is that, it has tools that allows users to choose how to organize on their own, and there must strictly be no 'deprecation' of one tool-set, in favour of the other. If something works for you, fine, if it doesn't, leave it. Choose, what is working for you. I request you to stop making generic statements on behalf of the entire community, based on your individual experiences. It's a given that if you're on the Forum, you love Evernote (okay maybe there are a few trollers in here). But Evernote as a viable company appears to be in trouble. My suggestions are based on an assumption that radical simplification is needed in order to save the company. In my opinion, Evernote's trouble stems from it being too complex for the average user. My suggestion is to distal the tool down to its core strengths. And to have a clear understanding of the core use of the product. It has been suggested that Evernote is a personal information manager. A place where information is stored and tagged, and then retrieved for creative work outside of Evernote. If that's the case, then there is a clear branding problem because the name "Evernote" implies that it is for taking notes. For me, Evernote at its core is an idea space. And that involves taking a lot of notes and connecting thoughts. As I previously mentioned, writing is thinking. To some extent (for me), Evernote serves as a personal information manager as I store lots of documents (in my case mostly PDFs of scientific articles and web clippings of personal and professional interest). But it's also so much more. It's a place I explore ideas, plan trips, take meeting notes, track my health and fitness parameters, etc. If I was just storing stuff, there are lots of simpler and cheaper ways to do this. For example, in the Finder on my Mac -- which is also backed up to the cloud, has folders and tags, and is available on all my devices (but the Finder does not have hyperlinks). So, I contend that at its core mission, Evernote is not a personal information manager and that seeing it as such is a reason for its demise. The average person will not pay for an additional cloud service to store documents and other files in a proprietary and somewhat arcane format (and yes, I understand and use tags, folders, links, and Evernote's search syntax). The average user does not understand how to use Evernote to its potential (remind yourself that "the average user" in reality has long given up and deleted Evernote). To grow it's user base and survive, Evernote has to understand its core product usefulness and it must simplify its interface. When I ask myself what I love about Evernote, it's not the mechanism that I use to store and find things. It's the immediacy of the tools that Evernote offers to allow me to think better: To capture things and connect the ideas that flow from all the items that I enter into Evernote. You know what I'm referring to: The amazingly great, much-better-than-the-competition Web Clipper, the always available screenshot crosshairs, capturing items with your handheld camera and having it OCR'd, emailing items into Evernote, dragging images and other files between notes, merging notes, linking notes, highlighting PDFs and having highlights sync (not available in OneNote or Bear), ... and ultimately building big ideas out of captured elements. Evernote helps me be creative. I don't just store a PDF. I read it in Evernote. Highlight it. Take notes. Get inspired. Search the web. Clip articles. Connect notes to other notes. Build a structure around my ideas. All in Evernote. No need to switch programs. Capture Connect Capture Connect ... Everthing flows. I recognize a difference between "note" and "taking notes"
We could look at the definition of note. Each note is stored as a folder; a container for files that are the note contents. My favourite tool is Notability on my iPad. Couldn't have said it better myself ? I'm glad B40E0148-49D-4C51-96FF makes sense to you (I know that's not what you meant). I suppose it's Apple package content. Speaking for non-engineers, I prefer real names (and not using searching/naming conventions). I agree that the definition of a note includes writing something short. It's also defined "to record or preserve in writing" and "a scholarly or technical essay shorter than an article and restricted in scope". I recall reading somewhere that the same 50,000 people are early adopters and have drawers filled with abandoned tech gadgets. I've tried and discarded so many programs I've lost count. In just the ToDo space alone, in the last year I've tried Omnifocus, Todoist, Reminders, and Things combined with TaskClone. Now I use Evernote tags: Today, Next, Soon, and Someday. My goal is to make these my only permanent tags and just use other tags temporarily for clipping and making tables of contents (links). I'm currently in the process of converting all my tags into links. Hundreds of tags and thousands of documents. Now I'm SO much happier with Evernote. I'm three intuitive clicks away from everything I need, even on my iPhone when I'm on the go. Just drill into my nested knowledge structure. No naming. No searching. Simplifying isn't necessarily dumbing down. I am experienced Windows PC user and I am beginning to feel sorry for you. If the internal engine of a note taking application is so poor that it cannot handle quality editing and output then it's time to replace it. Full stop. You can cite any old alternatives to Evernote's editor but unless you get the picture what users tend to expect by now you will be one of the coffin nails that seals Evernote's fate. What was novel and outstanding 10 plus years ago just is not good enough anymore. Evernote failed to meet European data protection legislation. As an experienced computer professional, you will no doubt be aware of the revenue Evernote is missing due to that. BTW, all I have seemingly failed to communicate to you is that your personal satisfaction with Evernote's Mac versions is simply not representative. The ratio of Mac to Win users (globally speaking) is approx. 1 :10. 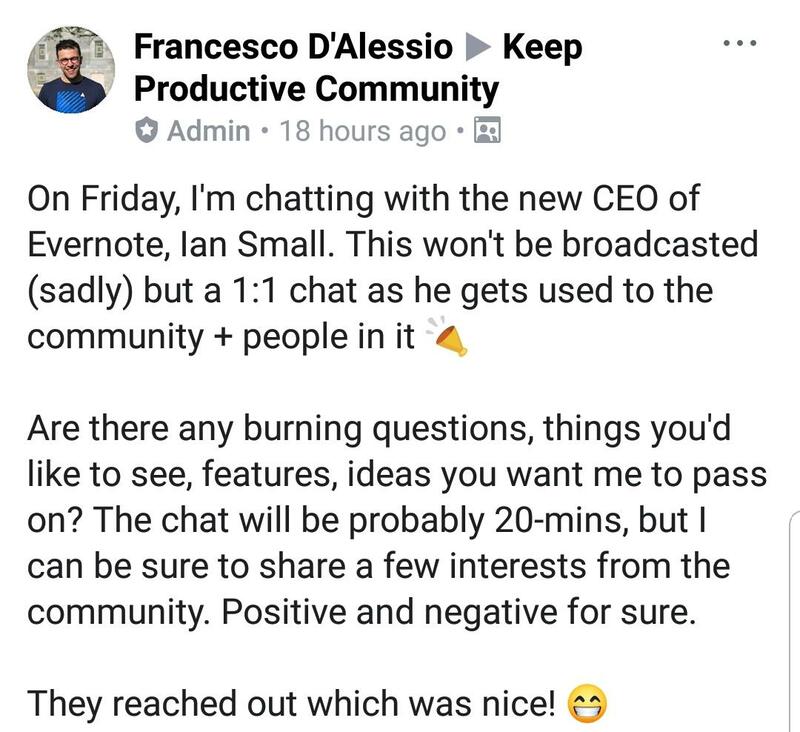 It is up to Mr. Ian Small to assess the situation and decide what service Evernote can offer next year and beyond. *I truly value the Evernote webclipper in conjunction with Chrome and Firefox on Windows. Evernote on Android is just pathetic because of inadequate stylus support. I use Evernote for simple Task Management. Instead of tags, I use the Reminder feature. It identifies a task as active, along with due date and completion date/status. Its just a note/folder id generated by Evernote. I had to access the note metadata database to identify the folder name. Hi. As illustrated above, your post seemed pretty loaded with generally negative views on Evernote's viability, which I don't think are applicable at all. Certainly (if the last CEO is to be believed), Evernote is now profitable, and has completed organisational changes to fit in with its expected growth in the next 12 months. It's as lean and mean a notation machine as it's going to get. Most of the complaints in the Forums are about Evernote not being complicated enough - requests to add more styles / outlining / mind maps / page layout / edit images / 'folder' hierarchies. And if you believe the 'average user' has given up, just check out the thousands of teachers / parents / productivity gurus posting out there with their views that "Evernote is the best" and offering templates from everything to packing lists to record collections. I don't think any of us can or should speak on behalf of users everywhere - Evernote seems to be doing pretty well (I believe it currently has more users worldwide than Japan has citizens...). I can certainly say what I want out of the product, but I leave it to Evernote to incorporate and prioritise my individual wants with the general feedback from everyone here and around the world... and their need to operate a platform that works on many different devices with varying screens, interfaces and operating systems. Your last comment I partially agree with - in the sense that adding more options and controls to the existing features would be unwise. I could live with Evernote pretty much as it is - provided the team can wipe out some of those pesky persistent bugs. ...And maybe a link to some kind of mind mapping tool so I can keep data in Evernote but see it laid out in a spider diagram... ? A killer feature for me would be -- every time you create a new note -- the Note Link is copied to an alternate clipboard such that you can immediately paste it and create a link to the Evernote Note that was just created. This behavior would occur, for example, following clipping a webpage or screenshot, or after adding a document to Evernote by dropping it on the Evernote icon. It could also occur if you use Apple Services to add an email to Evernote. In the case of Mail, you could immediately insert the Evernote Note Link into your ToDo program, calendar, or Mind Map program of choice without the requirement to switch to Evernote, navigate to your Inbox, and then copy that Note Link. Even better, in the case of Mail, would be creating an Apple Service (via the Mail Menu) that not only copies the Note LInk (as above) but also embeds in the Evernote Note that is created, the link/filepath back to the original email (as occurs in Reminders). It would be awesome if you could create an Evernote Note from an email that contains an embedded link back to the original email. Clicking on it opens the original email in Mail such that you can immediately respond or forward the email. Just underscoring that I love links and would like more link-related tools!! You seem to have missed the point that tags and notebooks connect notes semantically; it's as valid a connection as direct connections, and perhaps even more powerful. The missing "C" in your slogan is "Categorize". I'd put it before "Connect" in my version: even a link-based system requires you to mentally categorize a new note, since you need to figure out where to put it. If you con't categorize, then you cannot connect. I'm curious as to how your linking strategy plays out in real life, on a note database that's of some size, say 10,000 or more notes. Remember, you need as many links as you do notes (actually more, as we will see). So just as a thought experiment let's do a little math. In order to link up all of your notes, you need to add artificial index notes to contain the links. Let's assume that for convenience sake, you want your system to be feasible on all devices, including phones, and let's assume that 20 items on a phone display fits on a the first page of an index note. 20 items is a lot to examine by eye, (as before, 7 +/- 2 is a cognitively better number) but it's do-able; but if you have to page through an index note to find the next link, that makes your system a lot less "intuitive" (whatever that means) and convenient. OK, so first problem: now you need to set up, and maintain, 500 index notes to contain the bottom level links, 125 index notes to link to the previous index notes, and 6 or so index notes to link to the previous level. That's if you want a balanced tree. 636 notes. You've inflated your note database by greater than 2%, just for purposes of indexing, and you now need to figure out your tree structure and maintain it as you grow your note database. Second problem: given the assumed limit of 20 items per index note, you cannot index 10000 notes in 3 levels (20 * 20 * 20 = 8000). So something has to give: either the number of levels required to find any note, which breaks your "3 intuitive clicks" rule, or the 20 items per page, which breaks my not unreasonable assumption; i'd actually argue that 10 or fewer is much more easily navigable, for cognitive reasons, but that forces the required number of artificial index notes to be far higher. Third problem: with everything being 3 clicks away, then that's the minimum amount of work you need to do to find a note. Using notebooks and tags, I can easily surface currently useful notes in two clicks: click on "Todo" notebook, click on "Weekly Journal" note (which is the main driver of my weekly workflow) or other pertinent notes (thanks, reminders!). I'll stop there, as this approach seems infeasible over time and large numbers of notes. But this view of a link-based system is based mainly on conjecture; what am I missing in the mechanics of your solution? Other notes: is it a property of your system that each note is reachable by a single sequence of intuitive clicks, or can you get to a note via multiple paths? The former implies that the user has a fixed notion of the unique place in a hierarchy a note belongs, and doesn't miss a click on the way down. The latter implies even more index notes = more work to create and maintain. Forgive me if I don't see this as the panacea to the problem of getting newcomers to Evernote to latch onto it as a solution to their needs, much less as a scalable solution to growing a serious notes database in a feasible, extensible manner. In my view, a solely link-based Evernote would be a disaster. I'd certainly have to switch to something else, and I'd hardly be alone. Thankfully, I'm pretty certain that Evernote will never do such a foolish thing. I've been away for a few days, has the new bloke announced a new range of socks yet? For my profession, I use Tables of Contents from scientific textbooks (from Amazon if I don't own them) - to ensure that the structure is logical and comprehensive. Everything else is intuitive. I link to the Finder for storage of mission-critical documents (Snag Path). Don't store them in Evernote. It's amazing how easy it is to remember pathways to find information. Is there a reason you store "mission-critical" documents outside of Evernote? >>I﻿t's﻿﻿﻿﻿ amazing how easy it is to remember the pathways to find information. A benefit of Evernote is that I no longer have to implement and remember "pathways"
But hey, if you really truly think that your approach is the magic fixit for Evernote's woes, then you ought to make it a real feature request in the General Feature Request forum, here: https://discussion.evernote.com/forum/304-general-feature-requests/. Then other users, and possibly Evernote staffers, can comment and vote on it. Beyond that, I think I'm done here. Your method may work well for you, and might work for others, but it would never work for me, and I'd guess, a not insubstantial number of existing Evernote users. It would just plain not be the Evernote that fits my usage and workflows so well. I'm not prepared to build my house using only a hammer. Yeah, I collected tons of notes with the tag system. Over 10,000. It was so easy to let it built up. Became messy. And it was not easily retrievable in iOS when I did not have access to a desktop with Evernote. Converting to links has strongly encouraged me to write one note per topic. So much cleaner and more satisfying. I hope to whittle my notes down to under a thousand. Maybe much less. In particular, having one note per project has led to a huge improvement in personal productivity. I feel that I am able to think more clearly. A useful tip is to have a few links on the first level, and then go very flat on the second level. Evernote's limit is 100,000 notes per account; there may be performance problems before I get there. I rarely discard data. I've implemented archiving via an Archive tag. There's no mess at all. And most important; with Evernote, I'm able to easily retrieve data when required. @gbarry or other Forum Moderator: could you please move all off-topic posts (including mine) to a new thread, so your new CEO, and the rest of us, can clearly see messages to/from the CEO. Just drill into my nested knowledge structure. No naming. No searching. Uh, "drill into my nested knowledge structure" sounds like another's naming and searching. And if I want to restructure my structure? If I want to work back up the chain do I double the links? Sounds like more work and maintenance than I have patience or time, me anyway. Glad it works for you but don't proselytize for the rest of us. I went away for a weekend and this topic went right over the off topic cliff. What does matter is that Onenote is (a) integrated in Windows and Office and (b) there has been a tremendous push in the last couple of years to actually entice the corporate users to actually *use* it. At least that’s what I see. I work for a major corporation and we used to have Onenote installed with Office for ever, yet very few people even knew what it was. But in the past couple of years we started to get bombarded with free seminars, classes, workflow examples, and now there’s a fairly high percentage of people and teams using it for project tracking. The same thing is happening all across the industry, especially as IT departments are slowly rolling out Windows 10. Onenote is rapidly becoming a staple in the workplace, and this means people are more likely to start using it at home. To stay competitive, Google really needs a corresponding tool for businesses that use Google services instead of Microsoft, and all they have now is Keep... and Evernote doesn’t have the resources to break into the corporate market. I started the discussion with an infomation post; CEO change at Evernote. I do think the critical activity has been completed by the previous administrations and there's not much outstanding. There are limited resources to work with, which limits options. Just day to day management. There's always the possibilty of a take-over by another company, but that seems less likely as time goes by. The post quoted at the bottom of my reply. This. Couldn't agree more. I don't need any fancy updates. But I love the service and want it to last as long as it can. I do know there was data center costs, a necessary expense at the time. The new one note ( i believe its called one note 10) isn't really integrated well with Office anymore. This new version is completely different from the One Note you use with Office (which is One Note 2016). One Note 2016 is no longer in development. Microsoft has made the decision to actively develop and add new features only to One Note 10. This is where my problem lies. One Note 10 is being designed as a software that clearly looks like the priority lies with mobile users. A lot of the new features that Microsoft has added in the past updates makes it seem like they aren't interested in supporting PC users. Can you imagine that One Note 10 doesn't even have a pan feature on PC? They have a feature suggestion portal which they clearly ignore. They have an agenda make the app so rudimentary that anyone can jump aboard. I have no problem with this but they do this by stepping over the features that their core users want. Well, Onenote Desktop is supported for the next seven years, the dumbed down (for now) App version isn’t even getting installed on our machines. And the features are getting migrated over, e.g. it now supports collapsible outlines . But that’s not the point. Whatever the seasoned users of similar services think of Onenote doesn’t matter, they are a minority. The majority of users haven’t practiced any data management system outside of individual files and folders, but now are being exposed to Onenote at work via MS’ aggressive marketing and IT departments starting to implement and promote that software, which they have already been paying for anyway as part of MS Office. And when people are using Onenote at work on a daily basis, they naturally start using it at home as well - it’s free and familiar and they can use the same workflow and techniques they learned at work. It’s the browser wars all over again - it’s not the best browser that wins, it’s the one with best exposure to the masses. Guys this is might be the most important and positive news we have heard from EN in a while. It looks that they will finally start listening to the community and in my opinion this is going to be big for EN.